Bummer, I think. I am really dying to have a dip, especially after our drive and the last few hot days in Italy. My brother saw rain in April in Siena and Florence a few years before. We are lucky indeed. During our entire stay, it rains for only two short hours, something I should even call drizzle. Saying that I am glad to be back to Italy is a rather mild statement: it’s been almost twenty years since my last visit to this Mediterranean country but Italy offers all the bounty that I remember. The place has stayed intact. We have come to Italy to attend our friends S. and J.’s wedding and we are not disappointed. We find Italy colorful, laid-back, friendly, loud, delightfully messy, full of stunning architecture, and expectedly overloaded with history. Even the vespas we see at every street corner and the motorbikes that pass us dangerously on the roads seem appealing, but this is only perhaps because we are on vacation mode. “You never told me that your dad looks like Gérard Depardieu,” I exclaim when I first catch sight of S.’s dad. I swear — and I am not alone to — he is the exact Italian copy of the French actor. S. bursts out laughing when I tell him but he has to agree. Since it is our first experience of an Italian wedding, I am attentive to absorb and observe its culture in the tiniest details. The day is gorgeous, and S.’s father’s farm — where the wedding happens in full — a delight to discover. I am particularly curious about the type of food that is served, or the number of courses, and cannot get over the scrumptious prosciutto sliced for us on the spot that keeps coming. The Mortadella is equally delicious. “I think I am going to settle in this corner all night,” Stephen, one of S.’s American friends, tells me. He has his mouth full and holds a small plate with a few more slices. We stand next to a large table full of neatly arranged finger food, labeled in Italian and English, where a waiter is busy slicing the meat. When the plate is empty, he fills it again. “I could dine on prosciutto alone,” Stephen adds with a large smile, a clear expression of his food contentment. The risotto served as a first course is also a first welcome to Italian food. I know already that our week will be full of delightful Mediterranean dishes, a paradise to fulfill my taste for this type of cuisine. Since we’ve rented a car, our plan is to explore more of Italy while driving its countryside. S. helps us to plan our week and we eventually settle on the idea of spending the first few days in Cinque Terre on the Western coast. 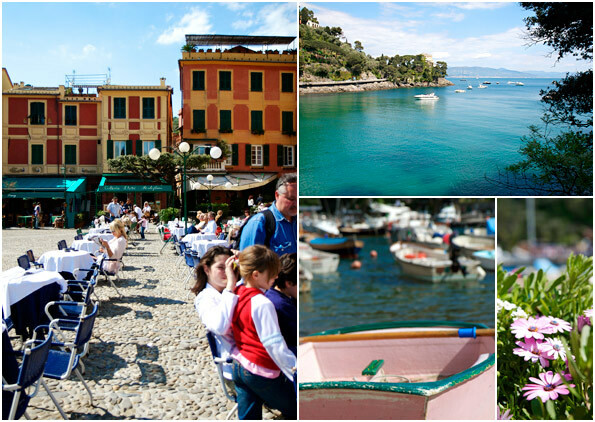 On the way, we decide to make a stop in Portofino. 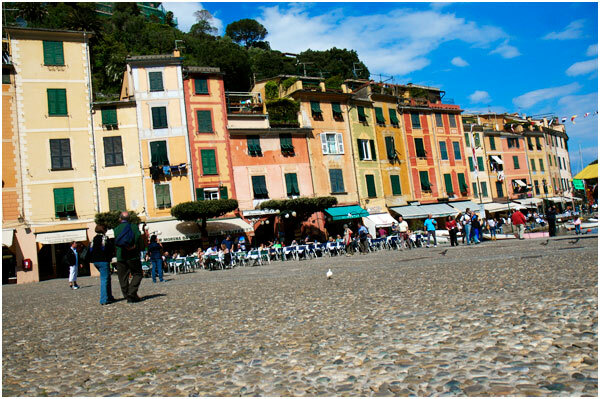 Portofino is a small Italian fishing village in Liguria, also known as a tourist resort where the villas nested on the hills surrounding the bay make the place look like the Hamptons of Italy. The small harbor is considered as one of the prettiest Mediterranean ports but to us, the place is rather a surprise. Perhaps it is indeed cute and picturesque with its winding narrow streets and clusters of tall old houses brightly painted, but we are somewhat disappointed by the series of luxurious boutiques also found in the village: they clearly contrast with the natural beauty of the setting. Why turning such a lovely location into an upscale looking resort losing some of its simpler charm? Never our cup of tea. But we are good sports and nevertheless enjoy a pleasant stroll along the ocean into the village, relax in a terrace on the main square where we have a refreshing drink while looking at the passers-by. Since it is a Sunday, the place is busy, especially with the warm summery weather. In fact, we are glad to be there at this time of year as we imagine the place packed during the summer. I cannot help but think about what the village must have looked like years before, when it was still untouched by larger forms of tourism. By contrast, Cinque Terre provides plentiful of quietness despite the constant influx of tourists attracted by the uniqueness of the place. Lying on the the coast of Liguria, Cinque Terre — meaning five lands — are five small villages (Monterosso, Vernazza, Corniglia, Manarola, Riomaggiore) tucked away on spurs of large rocks and arranged in clusters of tiny coves with small beaches surrounded by abrupt slopes where vineyards and olive groves are widely cultivated. 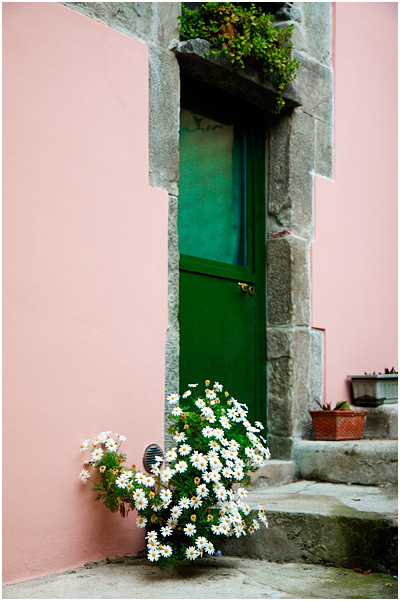 There, narrow multi-storied houses are also built close the ones to the others, and since each is painted in a different hue, together they offer an attractive palette of well-matched colors. Luckily, the entire place becomes a Unesco protected territory in 1997, and a National Park in 1999. Since no cars are allowed in the villages, the best way to explore the area is on foot, which we are thrilled to do. 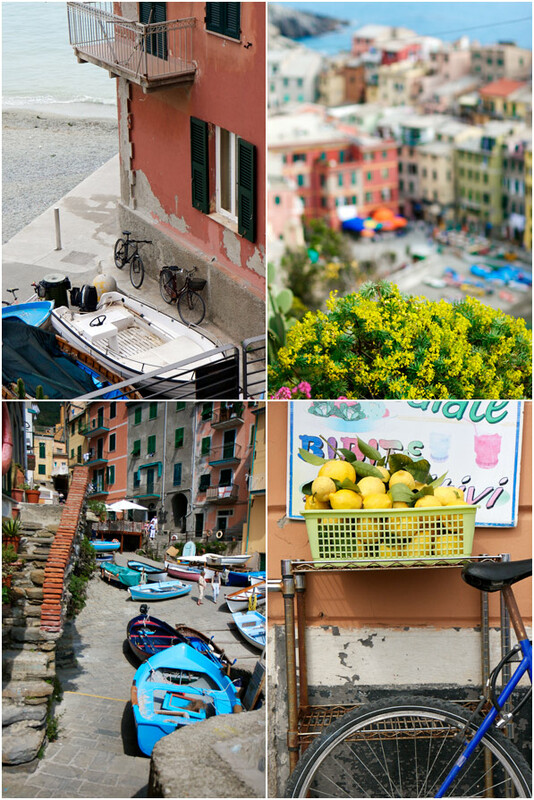 We stay in a small apartment in Manarola, one of the quietest villages, also one of the cutest we feel with Vernazza. The villages are connected by a system of coastal walking trails, sometimes flat and sometimes steeper and more hilly, allowing us to walk from one village to the next easily — to walk from the first village to the last takes about five hours. Trains run between the villages too, so when we grow tired of walking, we leisurely hop on one to return to a village of our choice in no time. Easy and convenient. 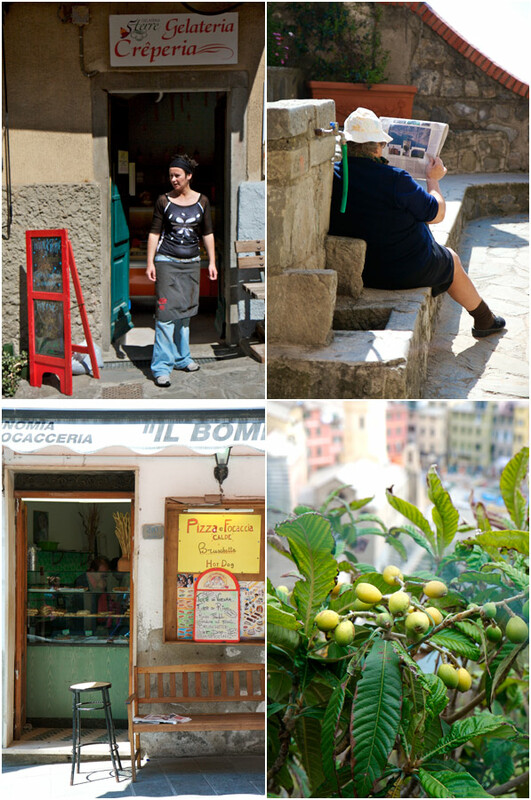 The villages of Cinque Terre receive many visitors indeed but despite that, life there stays slow and quiet, especially at night when the walking crowds are gone and only locals, and people like us living in the villages, stay. In the morning, I take pleasure at observing older people read the newspaper while basking in the sun and in late afternoon, I like to watch older women gathered to knit as they sit in an organized row on a street bench: every night, they come back to the same place at around the same time. 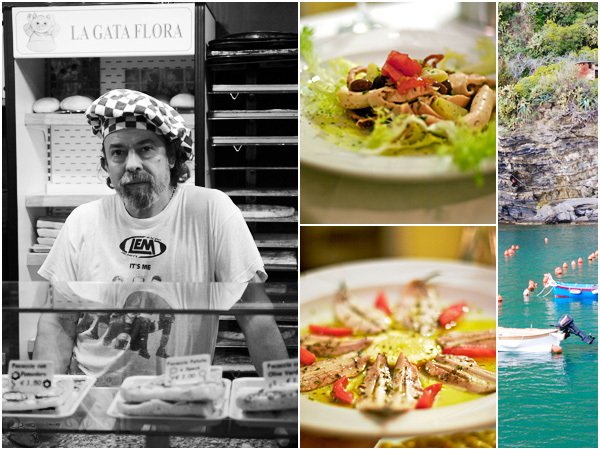 Due to its privileged Mediterranean location, fresh local seafood abounds. Every day, we pack a simple picnic made of prosciutto sandwiches to eat while sitting on a rock and watching life in the harbors and at night, we sample delicious fresh anchovies — anchovies of Monterosso are a local specialty — mussels, octopus — I particularly love the potato, octopus salads seasoned in fragrant olive oil and herbs that I eat — local grilled fish, cooked simply when we dine in a family owned restaurant in Manarola, or in a more elaborate way when we have diner with friends in Vernazza. 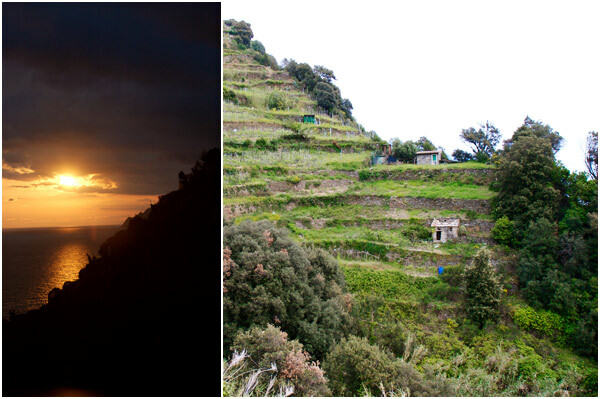 On the many terraced mountainsides found around the villages, grapes and olives are cultivated, as well as lemons and oranges. Limoncello is a regional specialty as well as pesto, like in the rest of Liguria. And since we are in Italy, pasta is of course de rigueur. After three days of rest and quietness in Cinque Terre, we are ready to tackle busy cities like Florence and Siena. If you have been to both places, I am not going to teach you anything. 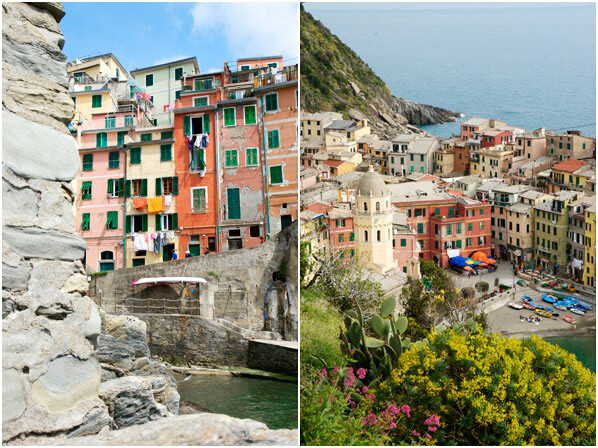 These two cities found in the Tuscany region are simply stunning. We cannot get over the architecture found at every street corner: we stop counting the number of astoundingly gorgeous monuments, bridges and churches seen everywhere. The two cities are only one hour drive apart, and are both rich of all the things anyone coming to Italy can dream of: history, cultural heritage, architecture and good food. — the Bistecca alla Fiorentina we sample in Florence is a must, as well as the artichokes. 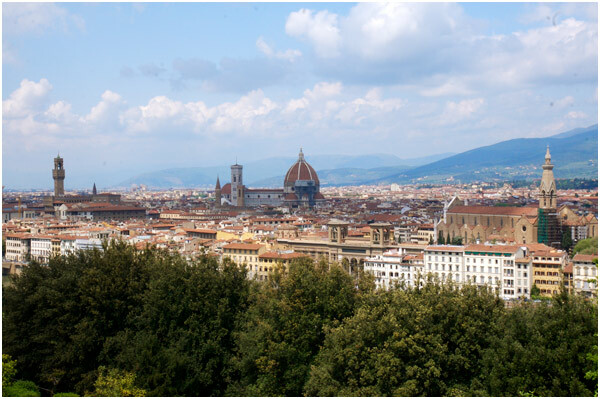 Florence, the capital in Tuscany, is the most populated city in Tuscany — with 364,779 people according to Wikipedia — and we also hear about the rivalry existing between the two cities, something that dates back to the Middle ages in fact. 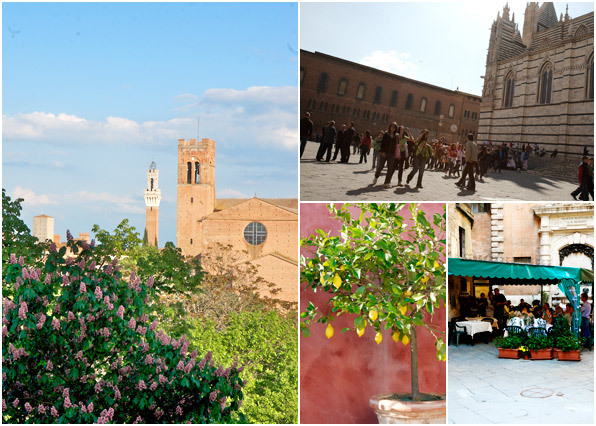 When we ask our Italian friend S. which city he prefers, he does not hesitate a second and answers assertively “Siena“. Another Italian friend responds that Florence is the one without any doubt. Us? We really have a hard time to decide. And perhaps in fact, we actually do not have to choose since both leave a memorable impact on us. 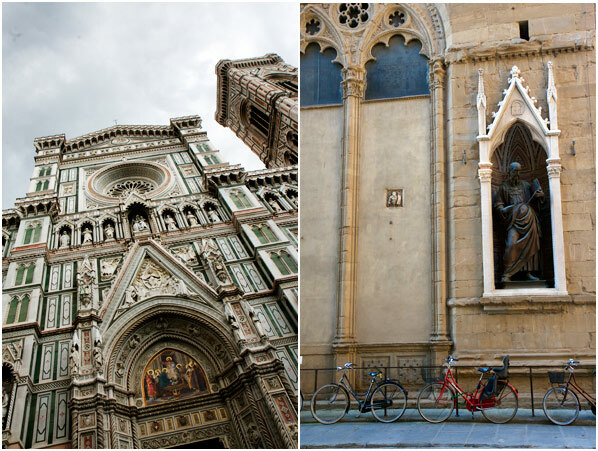 Worth noting that the historic centers of Florence and Siena are recognized as World Heritage Sites by the Unesco. If you are not a resident, you cannot drive in these parts. “We will never get to this place on time,” I tell P. in a panic, after I look at my watch and realize the madness of driving into a city like Rome. When we see road signs we can hardly read, it is already too late to make a turn. It’s worse than what I’ve experienced in other busy cities, like Paris, and I am still unsure how we eventually manage to reach the small apartment I’ve rented for a few days for us. “Only an hour late,” I tell P. with relief when the taxi finally pulls in front of a large house in the tiny street off Via Giulia where we stay. We’ve dropped our car to the rental place since to drive inside historic Rome, like in Florence and Siena, you need to be living in the capital. We are glad to see that the Italian woman that lets us in is still waiting. She does not speak English and we have hardly any Italian. But after a few gestures answering some of our questions, we quickly understand how conveniently located our apartment is: the Vatican is minutes walk on the other side of the Tiber river, and other roman highlights like the Spanish steps and the lively daily market, Campo de’ Fiori, are close-by too. Rome blows our minds away. The city looks like it’s somewhat changed over time without anyone trying to manage and organize the changes. Things are old, things are messy, but things look harmonious too. The street life is so present that when we find ourselves walking the streets at 1 am, we feel it could very well be 1 pm instead. Like in Florence and Siena, at every single step we take, or every time we turn, we discover something new, a piazza or a monument to wow us. 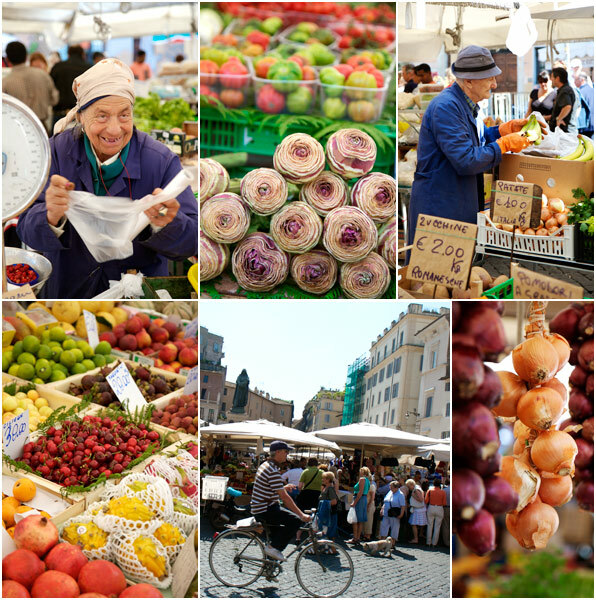 Being in Italy is a good reminder of how fond Italians are of their pasta, of all shapes and styles, risotto, mozzarella, cooking with tomatoes, eggplants and zucchinis — grilled vegetables is a common dish on menus — antipasti with scrumptious cured meats like Bresaola, pancetta, Prosciutto and Coppa — and naturally gelati. I had literally forgotten. Since there are gelati shops in almost every street, you understand quickly why the culture of eating a gelato at 10 am is like the one of someone having a morning coffee. Only natural. Me? I personally indulge in eating Roman artichokes every day, never tiring of them. I want to cook, especially after a walk to the Campo de’ Fiori market tempting me with delicious-looking fresh produce, but with so many restaurants and trattorias found everywhere too, I simply give up. In Rome, we do like the romans do: we eat out. I promise to cook next time we come. Because of course, there will be a next time. Italy is that addictive. Besides there are so many more places that I crave to visit, including more of southern Italy. 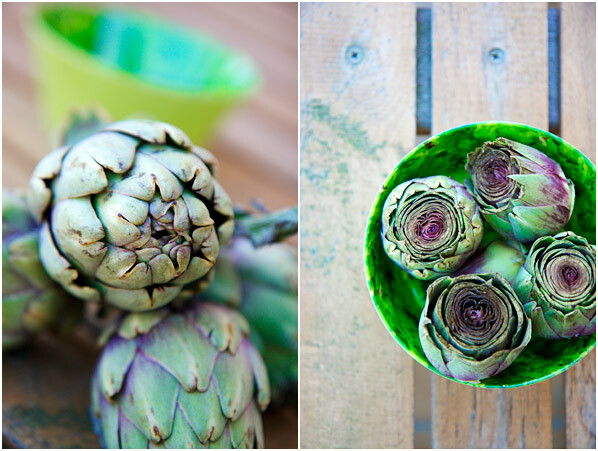 In the meantime, I will explore the idea of finding a good recipe for Roman artichokes. I am definitely hooked on these. Merci pour toutes ces belles photos et toutes ces couleurs. J’aime particulièrement celles de la Liguerie, c’est une invitation au voyage ! J’adore l’église à coté de la vespa dans les rues de rome – si ma mémoire est bonne elle est juste à côté du forum et de la place du capitole : je trouve ces endroits magiques. Bon w.e et bonne fin de voyage. God, your photographs are gorgeous. I almost went to Florence a couple Aprils ago but the Southwest of France was so much cheaper. Next time I’m in Europe I’m determined to think outside the box and not just stay in my French comfort zone. I’d love to work on my Italian, see the sights, and taste the tastes! Beautiful photos! I feel like I got to tour with you. I think everyone that visits Italy gets addicted. I threw some coins in the Trevi Fountain just to be on the safe side! Magnifique photos. J’aime beaucoup celle des petits vieux qui jouent aux cartes… Moi, j’ai toujours peur de déranger en prenant de telles photos! love love love your photos, Bea! what a wonderful adventure! Guess it’s been 12 years since we were in Porto Fino! Stayed in a hotel on a curve just before you got into town, only hotel open, late fall, no tourists. Walked a path through the hill past olive trees and houses into town! So pretty. 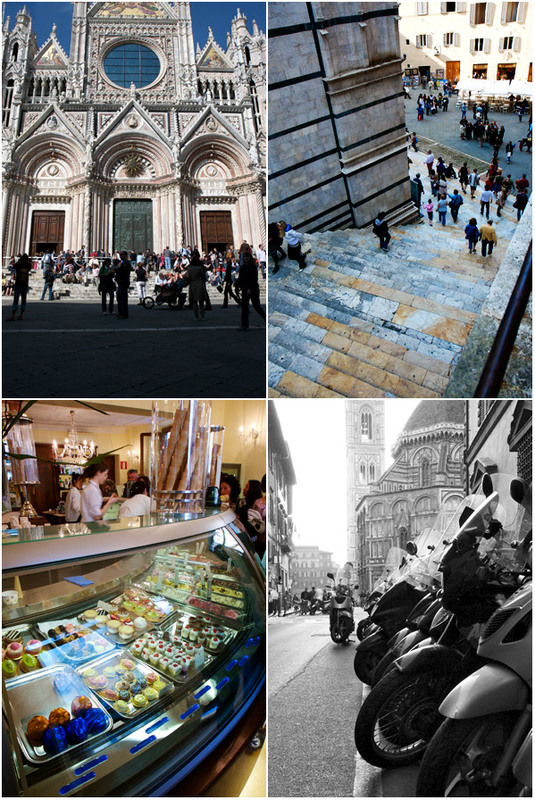 Florence, Rome, Siena: wonderful. All you photos bring so much back! Time for another Italy trip. And what an amazing wedding! Elle sont tout simplement magnifique, tes photos! 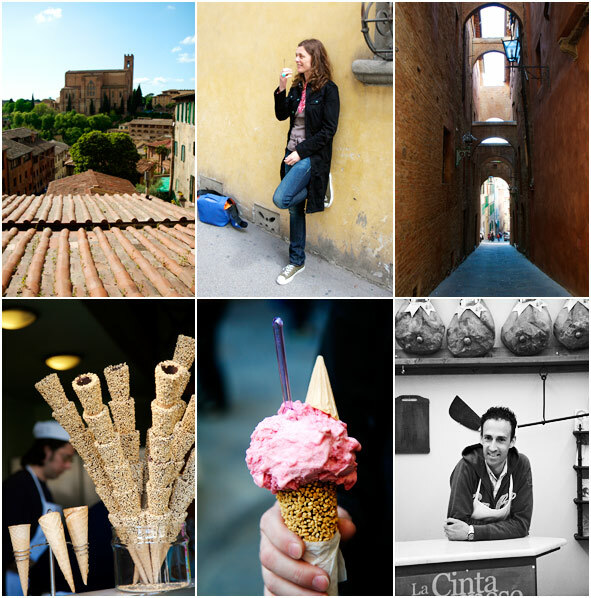 Thank you for taking me to Italy with you – I can almost smell and taste it from your beautiful photographs! Mi manca Italia! Beautiful photos!!! Une petite visite en Italie gratos…Super! Merci de nous partager votre talent. wow, drop dead gorgeous photos bea! i think your travel photos are even more gorgeous than your studio food photos, if that is even possible. you truly capture the essence of the beauty of italy. i could smell and hear everything. your eye and palettes are truly to be admired. Thank you, thank you, thank you for sharing your fabulous photos and experiences-it’s just what I needed! It’s two weeks since I returned from Italy and I’m homesick for everything about it. Thank you for sharing your wonderful trip and photos with us all! Definitely reminded me of my last trip there, which was probably 15 years ago … time to get back there! Wonderful post… youve got me remeniscing about my time there (way too short)! I def want to go back, for an extended stay. When I see things like this, the desire is almost painful! WONDERFUL post/ pics. Keep it up! Thanks for sharing Italy with us Béa. The colors, the food…absolutely breathtaking! Trop de talent sur une page!!! Nah….jamais je ne me lasse de tes photos! Tes bleus et jaunes sont superbes! These photos are simply GORGEOUS, merci beacoup chére Béa! 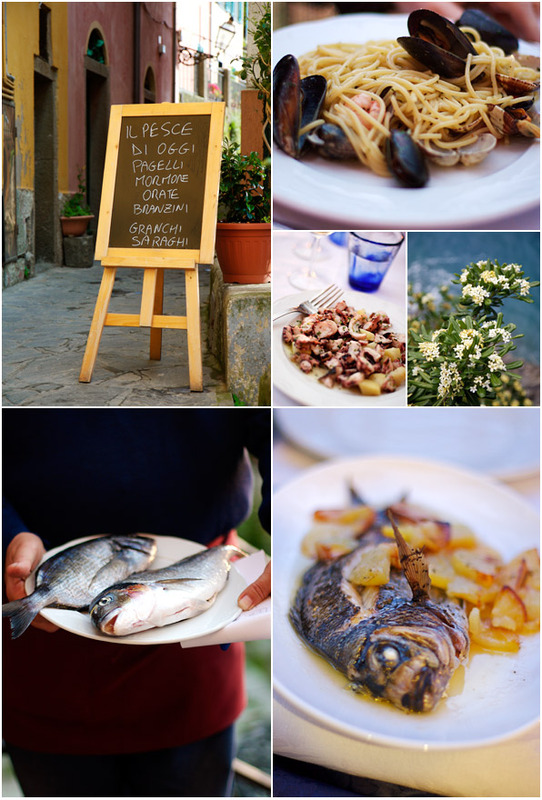 I love love love italian food and culture, and this post has made me nostalgic (the only time I’ve been in Italy was back in 2006). I’ll be back, I promise… Keep enjoying the Bel Paese. Hugs and good wishes from Mexico. I love Italy and with your photos I want to go now again and now!!!!!!! Coucou Béa..je suis de la Toscane et les endroits que tu visites, je connais par coeur..C’est toute ma terre de naissance à travers tes photos que j’admire et cela fait chaud de les voir…On s’éclate dans les couleurs et les couleurs t’arrivent dans un océan de bonheur. En un clic dans la petite boite et hop destination le monde pour un sublime partage…merci de nous l’offrir….à bientôt. Glorious. I’d forgotten quite how pretty that region of Italy is – I haven’t been there in years. Your photos do it wonderful justice. I’m so glad you are having a wonderful time. Your pictures are beautiful. Thank you for sharing your trip with us. Oh, Bea! You’ve brought back such a plethora of wonderful memories for me. You’ve even, somehow, managed to make me think fondly of Florence, which I somehow just didn’t really like. You’ve given me a big itch to go to L’Europe encore. We haven’t been for too many years now! Bellisimo, bella bella! J’ai l’impression d’avoir effectué un petit voyage en Italie grâce à tes magnifiques photos et ton récit : un vrai plaisir ! what an incredible amount of beautiful pictures in one blog-entry! wow! thank your for sharing that all to us. I love your travelogues! 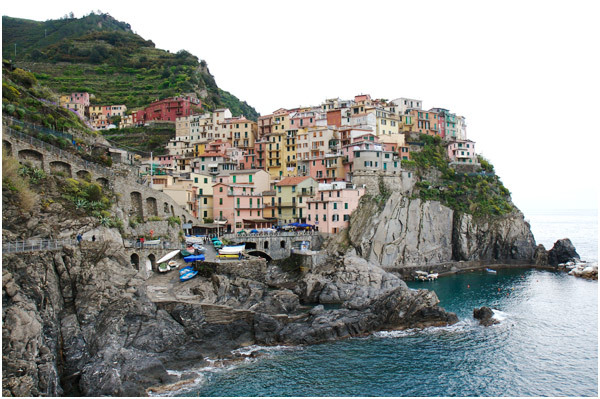 The photos bring back memories of my trip to Cinque Terre 10 years ago. I look forward to catching up when you return. What a wonderful trip… those photos are amazing, right out of a travel book. Brilliant Bea! I hope you get to make a book one day of all your travel photos, they are phenomenal. Merci de partager avec nous ces superbes photos! L’Italie me manque beaucoup. Bonne fin de voyage, profites-en bien. I spent this past fall in Florence, and your pictures brought back such wonderful memories. They made me want to return immediately! Thank you. Bea-these are just stunning-and I feel as if I were in Italy right now! Thank you-it made my mother’s day! What wonderful pictures Bea. Really amazing. I am Italian but I live in Spain so when I go back by car I pass through Liguria and I stop by Cinqueterre that I find touristic but at the same time so quite and relaxing. The wedding looked a great Day indeed. 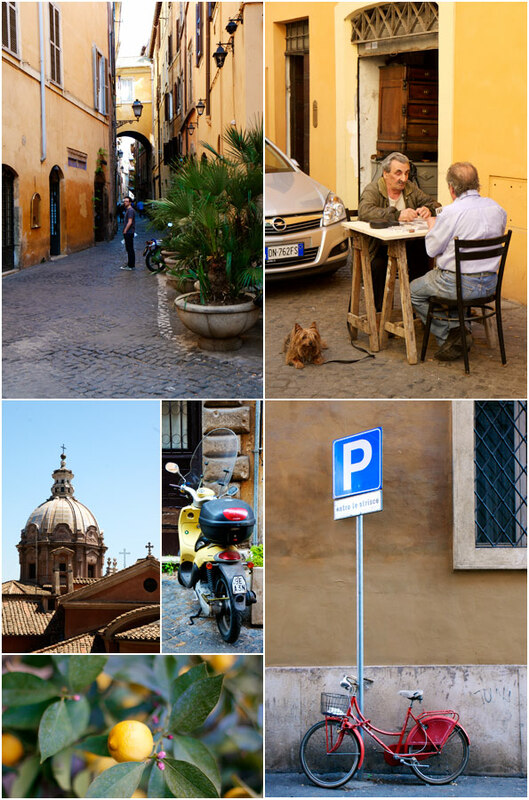 And the images of Rome are so familiar… you were able to capture Rome in so many different angles… Really enjoyed your post! tes photos sont bluffantes, une fois de plus! qu’est ce que je donnerai pour manger une fabuleuse glace sous le soleil d’Italie! complimenti…. what a nice page! Have not seen better pics of Italy for a long time! Can’t wait to see the new posts. Should you ever come down south… please let me know! J’arrive déjà au bout des photos… J’aurais voulu que cela ne s’arrête pas. MERCI pour cette ballade dolce vita ! 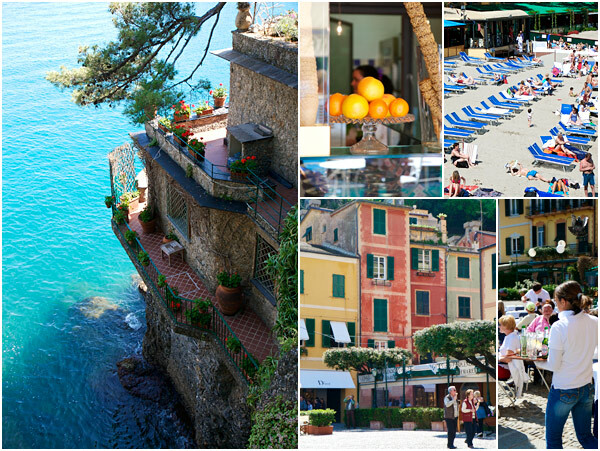 I bookmarked this post in case I’m lucky enough to get to Italy anytime in the near future. I’ve been there, nearly 15 years ago. I literally forgot how beautiful it is…almost like a fairy tale. Your photos are breathtaking. These are amazing photos!! I have been a fan of your blog and I posted about your wonderful works in my little blog here http://www.lookmaistory.typepad.com. 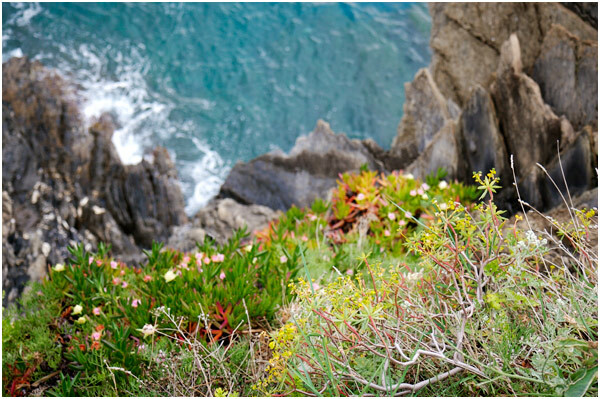 Absolutely beautiful photography….and a lovely post to read. It makes me crave Italy even more.!!! Thank you for this post – what beautiful images. I was in Tuscany a few years ago and this brought back all the memories. Also, I have just finished my degree in which I majored in photography and cited you as my inspiration – thank you! Wow, so many photographers…and their all so beautiful, amazing. Now i just want to run across the atlantic to Italy. Amazing. Inspirational. Thank you. je garde un merveilleux souvenir de vacances que nous avions passées en Toscane avec des amies, il y a …15 ans déjà ! Nous étions parties à l’aventure pour trouver par chance un agriturismo à louer à 5 km de Florence, l’appartement dominait les collines d’oliviers et un couvent était juste à côté, des soeurs à la retraite vivaient là et nous fournissaient en ..crèmes dessert, elle devaient penser que nous étions trop maigres !! San Giminiano est étonnant comme village avec une histoire hors du commun. Rome est électrique n’est ce pas ? Absolutely FANTASTIC BLOG. Pictures and commentary makes you feel as though you are there…can’t wait to go back. I love Italy and you show me new face of it. Tnx ! Magnifique reportage, de mon côté j’ai eu un gros coup de coeur pour Manarola que je ne connais pas du tout! ce paysage est a couper le souffle! what a beautiful account of your trip… i wish i could see the country through your lens! you have such an eye, it’s amazing! i got married in portofino, in the little church perched up on the peninsula with the sea on both sides. what a beautiful spot. it was early april, so considerably less touristy – although i did have a busful of japanese tourists photographing us in the harbour as if they were being paid for the photoshoot! 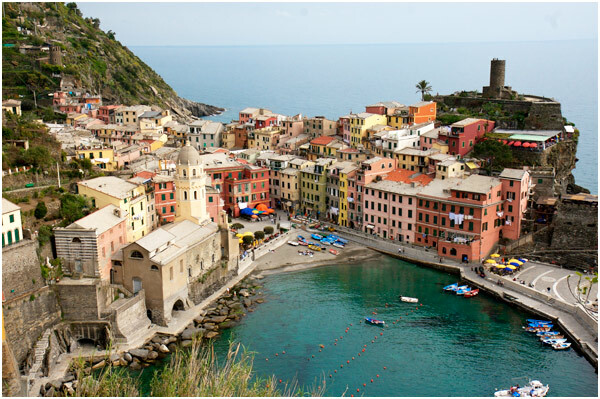 i still liked it, but by the looks of it, i will have to go to cinqueterre next. Wonderful amazing photos! We took a similar trip in September. This makes me want to go back! As ususal Beatrice, you totally made my day. I have been to Italy many times, but never seen these places. Absolutely stunning! Wow. these are beautiful photos. You have eyes of a great photographer. These photos combine with yours interesting and colorful stories make europe the next country I visit. what beautiful pictures!! i visited italy about 7 years ago, and your photos made me long to go back! 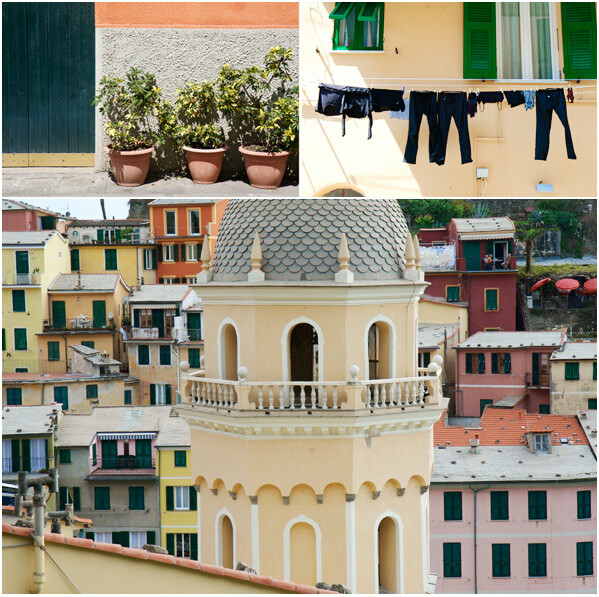 i visited cinque terra while i was there, and your pictures absolutely captured the charm of it…thank you for sharing! cinque terre was an absolute dream. your photos reminded me of how much i miss it! Somptueuses photos! Depuis le temps que je VEUX aller en Italie..! Gorgeous photo montage, Bea. Beautiful. I adore the Mortadella too, it took me by surprise the first time I tasted it. Je suis allee dans les Cinque Terre, Portofino et Florence en fevrier cette annee, c’est magnifique un peu hors saison… Les photos sont sur mon blog. Thank you for your post…the photos take me back to all that I remember to be so beautiful about Italy. Your photographs are so wonderfully evoking! Bea, your photos are ridiculously beautiful. They make me wish I could return to Italy this moment! I am so glad you had a great vacation! Great stories and great pictures! Definitely a super post! I love Italy and seeing this photos makes feel anxious to go there, to all these lovely places.Great post and great photos. Hi! It’s a wonderful blog, beautiful pictures, interesting recipes! I love to come here, i’m travelling each time. Belle foto, grazie Bea! So glad you guys had good weather, was great to hear Phil rave about Florence, my hometown. Cinque Terre is indeed splendid, I wish you had seen San Gimignano as well. Merci pour ces photos magnifiques et pleines de lumiere. Elles capturent si bien la vie, l’architecture et l’histoire de cette partie de l’Italie!! Craquantes photos de mon pays…..et grand envie d’aller dan les cinque terre, jamais était là-bas! Aïe aÏe aïe…j’ai failli y aller pour le we du premier mai, mais faute de temps et d’argent on a annulé. Je ne regrette pas, mais tu me donnes vraiment envie d’y aller!! the homesickness, it is too much! beautiful photos. Tu devrais être sponsorisée par l’office du tourisme italien ! Your pictures of Florence and Sienna make me so want to go back. Bonjour, c’est magnifique ce travail texte / photos. Thank you, thank you everyone. Your comments are overwhelming me with good emotions! I hope that you will all be able to travel to these places one day too. Many of you have already, I was happy to hear! So I am thrilled and happy I could share some of my experiences there. Your photos are amazing. I really enjoyed them. Love the one of the odler lady at the market. But then I loved them all. I was able to enjoy a little of Italy inside my own home. Thank you. Just had an artichoke today for lunch. I ljut love them plain dipped in mayo. Voilà quelques photos qui me ramènent quelques jours en arrière à Florence, Sienne et d’autres petits endroits sympas de Toscane. Je vous invite à partager un peu mon voyage sur ma page. Vos photos sont superbes. Bravo. Merci pour le voyage virtuel, les photos sont vraiment splendides ! Ooooh, j’en ai plein les yeux. Merci pour tes photos Bellina. you’ve transported me, thru this most beautiful comprehensive post, from the relative dull of my dark office to this the most beautiful place! 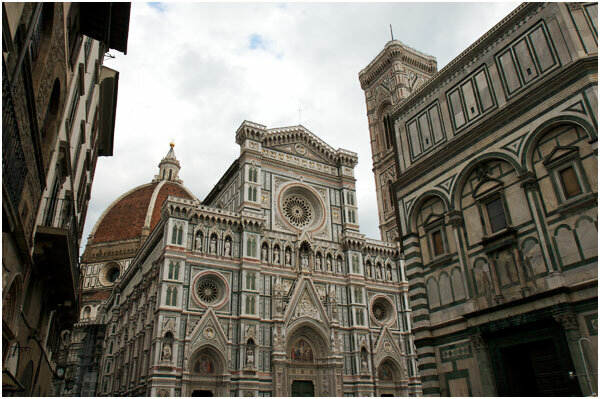 I’m reading a book on Brunelleschi’s Dome, the great creation of the great Florence cathedral. Now I have to visit it Florence! Beautiful pics! Thank you. What beautiful photos – you brought me back. I almost wanted to cry. My favorite photo is of the butcher smoking a cigarette. The only thing is, just can’t agree with you about the Hamptons is a bit like Portofino. Maybe it’s because I’m a New Yorker and am not a big fan of the Hamptons and Portofino is an amazingly beautiful place, but I just shuddered to think of the comparison. What a great post. Thank you for it… it has made my bad day better. 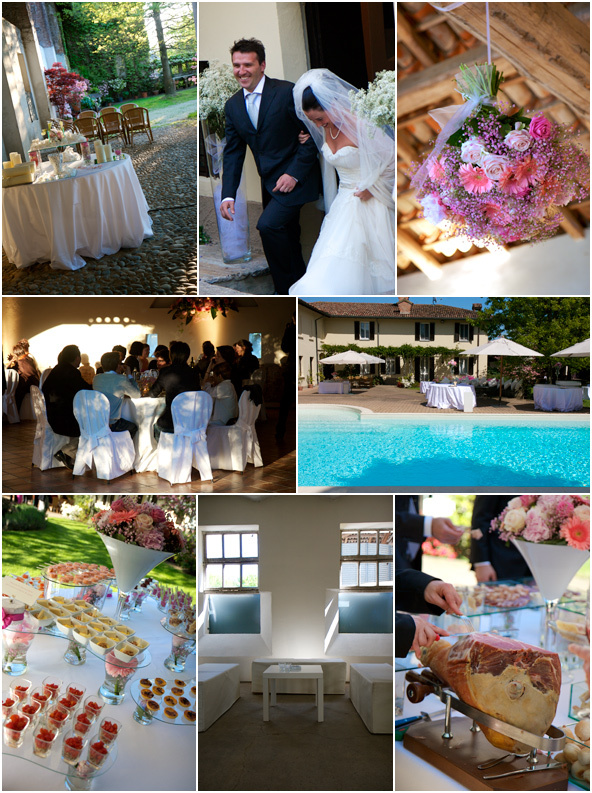 We were married in Tuscany last summer and I’m still upset it’s not being repeated again this year! Seeing my home through your eyes and stories is…. AMAZING !!! I love your blog, your works are great..
this post makes me smile, in florence you took a pic of my WINDOW !!! God, how beautiful photos! Have you ever thought of publishing your own photo-book? Or maybe you have already? I’ll be in Tuscany this September, hope to see as beatyful places as seen here. What magnificent photos. Just returned from three glorious weeks in Florence, Siena and Venice….it is as beautiful as your snaps. Thank you for sharing. thank you, thank you, thank you!!! i needed that. it was such a pleasure to view your photos. I have always wanted to visit Italy, and the pictures of the countryside just make me want to travel there, even more. Wonderful wedding ceremony and party! And all pictures are perfect! 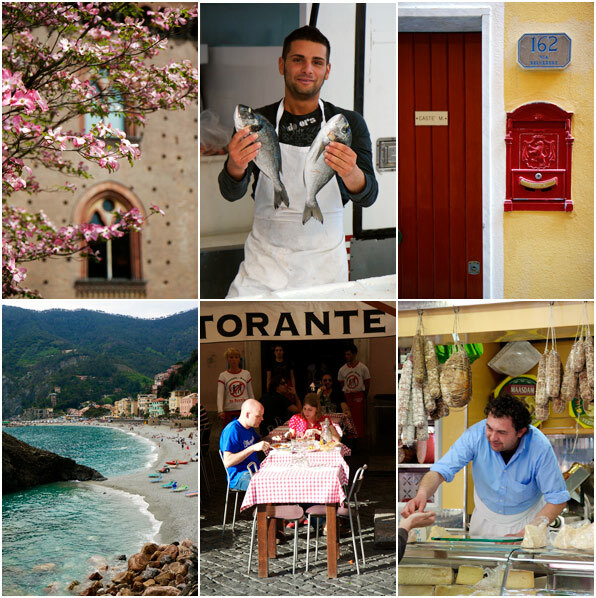 I am traveling to Italy this summer and thoroughly enjoyed reading this post….Your style of writing is so fluent and easy to follow…Thank you for inspiring me and getting me so excited to see this beautiful country! 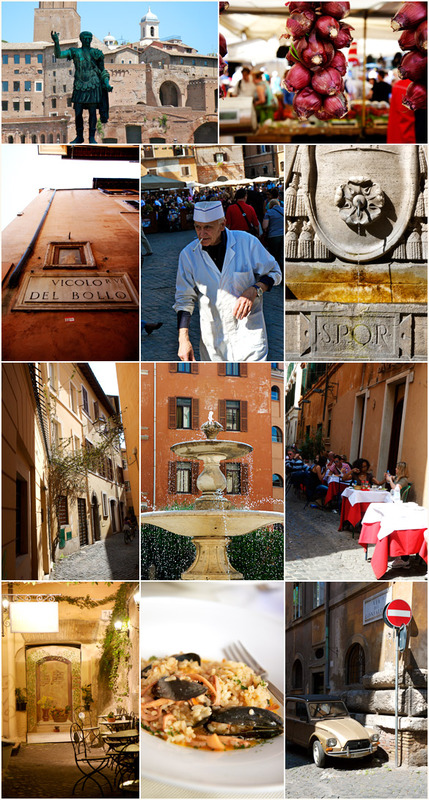 I love your photo collages from Italy! How did you enjoy the food?